Mandarin Oranges | Molina & Sons (PHILS.) Inc.
Sunbest Mandarin Oranges is made of seedless; peeled oranges in portion. It is usually eaten plain or in fruit salads. Its bright citrus flavor is suitable for salads, vegetables, main dishes and desserts. 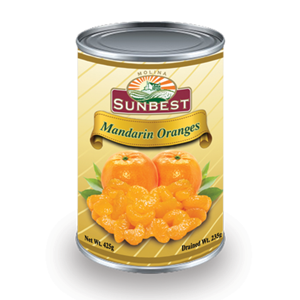 Feel free to experiment with any variety of your favorite fruits in combination with Sunbest Mandarin oranges. Mandarin oranges contain vitamin C, which is a good instrumental in preventing colds, also vital for the proper functioning of a healthy immune system.